The Tower Homes team is excited to share the recent news about Cahaba Farms in Trussville winning a Gold Award for the Eastwood floor plan. It will be on display during the Birmingham Spring Parade of Homes. We appreciate this honor and say thank you. You’re invited you to come see this new home community this weekend! The stunning Eastwood floor plan features 4 bedrooms and 3.5 baths. The designer kitchen includes a waterfall quartz countertop on the island, stainless steel appliances including a gas cooktop, wall oven, and microwave, features 36’ painted cabinets and a fabulous farm sink. The kitchen opens to a spacious dining room that features a gas log fireplace with distressed wood and the main level master suite with a barn door entry and hardwood floors. The ensuite master bath has granite countertops, a tiled shower, and a separate garden tub. This home also features convenient drop zone, walk-in pantry, and large laundry room with built-in cabinetry. Outside, the large deck overlooks almost a 3-acre backyard which backs up to Cahaba River. Where else can your family experience modern farmhouse style living, riding four wheelers or fishing in the backyard while living in the convenient location of Cahaba Farms in Trussville? This weekend, don’t miss your chance to tour this available community and its Gold award winning home. 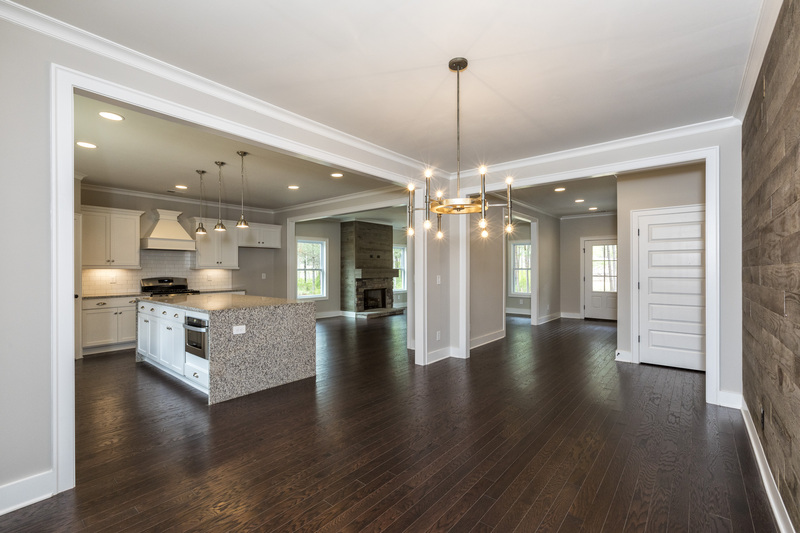 The Eastwood home plan at Cahaba Farms in Trussville will be featured during the Spring Parade of Homes on May 4-6, Friday-Saturday from 10am-6pm and Sunday: Noon-6pm. Additionally, the Eastwood is open every weekend on Saturday and Sunday from 2-4pm. For more information, please call Sandy Reeves: 205.365.3298 or Rodney Bates: 205.335.0354.